Axis Point was Charlie Whitney‘s first project after Streetwalkers. 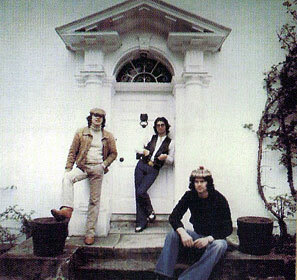 Formed in 1978 by Whitney, Family alumnus Rob Townsend and Eddie Hardin, who had replaced Steve Winwood in the Spencer Davis Group in the late 60’s. Bassist Charlie McCracken had been in the first Taste lineup, and then Stud with other Family-men Jim Cregan and John Weider. McCracken also played with Rob Townsend on Kevin Ayers’ Yes We Have No Mananas (June 1976). In my ever-so-humble opinion, Axis Point was a band that carried on the bluesing and boozing efforts of the Streetwalkers, with many good guitar riffs and hooks. Charlie carried on with his steel guitar playing, and the synthesizers and keyboards added an “updated sound” to the music. A lot of it is indicative of the times, and reminds me of Eagles and Bad Company. Eddie Hardin’s low-range vocals sound a good bit like Paul McCartney in “Wings” mode, and a lot of songs sound like Wings, too! All in all, good road music, good drinking music, some acoustics, sometimes depressing, but nice and catchy. The second Axis Point album comes back a little heavier, and after one listening “Boast of the Town” was in my head for good. It does sound like Streetwalkers, although a little subdued to say the least. It’s not that bad either, and in fact it kinda grew on me after I listened to it a few times. Some of the stuff sounds cheesy and dated like the discofied bass runs on “Women Of The World”. The vocals are definitely weak, however there are a few good songs; I liked “Moving The Night Away” and “Newman Street” in particular. Charlie Whitney leads Los Racketeeros.